Why would someone sell nearly everything he owns, then pack up and travel for three years—alone—on a motorcycle? One day Allan Karl woke up to discover that he was unemployed and his marriage had ended in divorce. 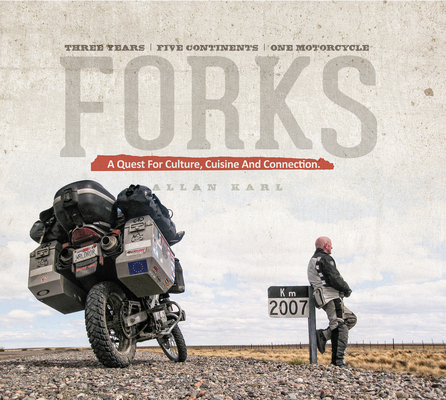 Allan looked at these forks in the road of his life as an opportunity to both follow a life-long dream and pursue his passions. He hopped on his motorcycle and traveled around the world. After three years and 62,000 miles of riding, through 35 countries on 5 continents, he returned home only to set out on another journey—to share the truths he'd uncovered and the lessons learned during his adventure around the world. "Even though I set out on his journey alone, I was never alone. If I was ever lost, lonely or hungry, I would turn around and always find someone there." The real truth is that it's easy to connect with people—humanity—even in the most challenging situations. Allan Karl has never been able to sit still. With an insatiable passion or travel, culture, people, and food, he has explored more than 60 countries, photographing, writing, and blogging about them along the way. Allan is an author, photographer, marketing entrepreneur, professional keynote speaker, and committed adventurer. He is also principal of WorldRider Productions where he focuses on speaking, publishing, coaching, and creating content that brings to life his stories and experiences around the world—demonstrating again and again how the discoveries he has made and the lessons learned can help all of us lead more rewarding lives. Allan grew up in Connecticut and now lives in Leucadia, California.